By combining the essential requirements of today's two-way radios, with many advanced ‘high tier’ features only found in radios requiring significantly higher investment, the Opus D24 delivers a superior price: performance ratio. The Opus D24 employs the very latest components, technology and manufacturing techniques. This is coupled with our custom designed and updateable system firmware. As a result, the Opus D24 exhibits superior performance and flexibility. 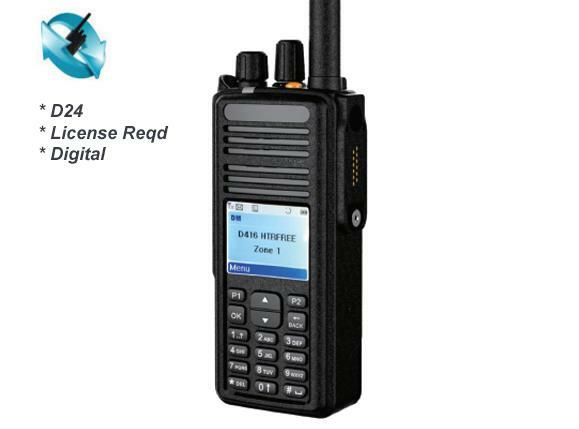 • Automatic dual-mode for analogue and digital (DMR) radio systems. • IP67 rated - waterproof to a depth of 1m for 30 minutes! • Simple controls and voice annunciation make operation intuitive. • High capacity (2000 mAh) Li-ION rechargeable battery pack - provides over 24 hours use between charges. • Very loud (1000mW) and clear audio ensures reliable communication. • Tough and durable to survive everyday use - thanks to a polycarbonate casing and aluminium chassis. • Highly configurable for complete flexibility - over 2000 channels and 250 zones available. • Desktop intelligent fast charger - recharges the battery in just 4 hours. • Built-in VOX function, with adjustable sensitivity, for hands-free use. • Sleek and slim, ergonomic design - very comfortable to carry and use. • Motorola compatible, multi-pin accessory jack for the widest choice of audio accessories. • Available without display & keypad (D20) for low-level users. • Extensive range of additional accessories - including headsets, microphones, carry cases, car chargers, programming kits and more - to enhance operation and suit your own operating requirements. • Man-Down and Vibrate alert as standard, with optional GPS/Bluetooth version for advanced systems. Why choose the Opus D24? : The Opus D24 is the perfect choice for any radio user or organization seeking a rugged, waterproof, reliable, high quality, digital two-way radio with loud ‘punchy’ audio. It’s ideal for anyone upgrading conventional analogue radio systems, replacing older first generation DMR radios or requiring the advanced features found in the Opus D24. Simple & Reliable: Despite the advanced features, the Opus D24 is simplicity itself to use thanks to it’s ergonomic design, loud and clear audio and intuitive menu-driven operating system. The waterproof and robust, high quality casing keeps it operating in the widest range of tough workplace environments. When your users, workplace or application have specialist requirements, the Opus D24 also supports a wide range of quality accessories. High End Features: The Opus D24 is a very advanced communication tool. As standard, the radio is supplied fitted with a man-down and movement sensor. This can be used to alert others in the event of an operator fall or unconsciousness. Vibrate alert is also fitted as standard, facilitating use in noisy environments or by users with hearing impairments. Bluetooth and GPS are also available as an option. Contact us today to arrange a demonstration of the amazing Opus D24!